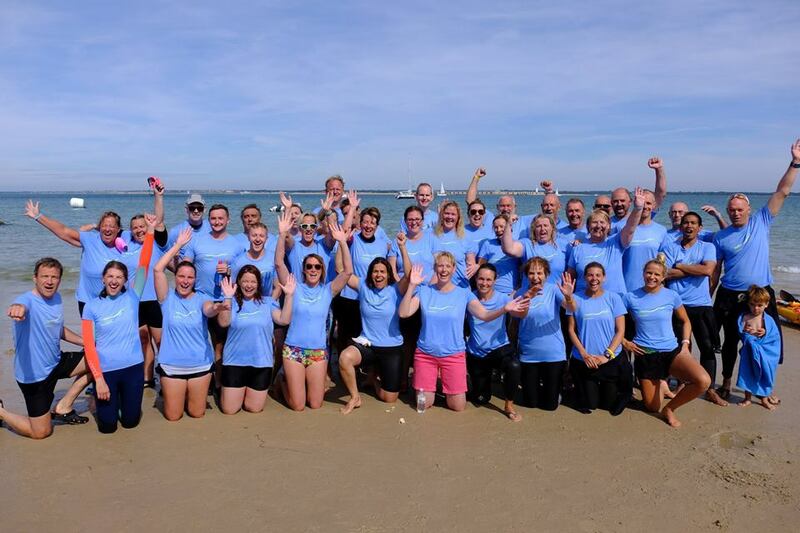 On the 4th of August 2018, forty amazing people swam across the Solent from Hurst Castle to Colwell Bay, supported by a team of volunteers including marshals, kayakers, boats and Freshwater Bay Independent Lifeboat. Swimmers included Island MP Bob Seely, four swimmers from Switzerland and Claire Gardner who broke her wrist just two weeks ago! The annual swim is the biggest fundraiser of the year for West Wight Sports & Community Centre. The charity centre receives no funding from local government and is a vital hub for the WestWight community and Island as a whole. Swimmers left Yarmouth just before 8am by boat to Hurst Castle and swam back to the Island supported by a team of 28 kayakers who buddied with the swimmers. They were also backed up by a flotilla of boats and the Freshwater Bay Independent Lifeboat. Mark Turner, one of the original West Wight Swimming Club members lead the swimmers and crossed the Solent in less than 30 minutes, arriving at Colwell Bay to a carnival atmosphere with hundreds of family members, friends and supporters. Money raised goes towards keeping West Wight Sports & Community Centre running. If you would like to donate or are interested in next years’ swim, please visit our Solent Swim page.